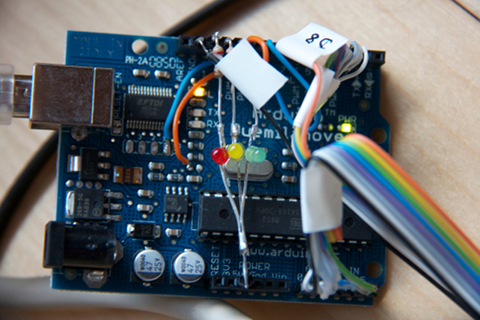 Currently the firmware is implemented on an Arduino 2009 board with an ATmega168 running at 16 MHz. Similar AVR board should work, too, but note that an FT232 USB-to-serial bridge with RTS/CTS hand shaking pins available at the AVR is required. The additional hardware required for the Arduino board consists of an adapter for the Amiga parallel port, the RTS/CTS handshake lines on the board itself, and 3 LEDs to show the operation modes. All parts are fairly simple to construct. 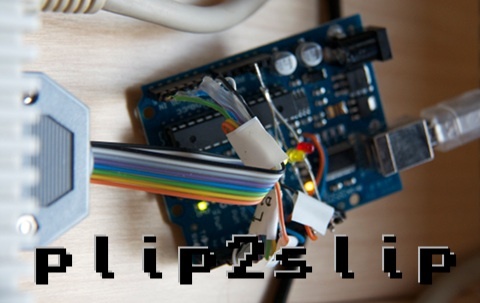 You need to build a cable from the Amiga Parallel Port (DB 25 male) to the Arduino. Try to use only a short wire length otherwise signal quality will suffer. Up to 10 cm are suitable lengths.
.  Solder Pad X3                              DIGITAL .
.  4   3   2   1                                      .
.  (x) (x) (x) (x)                                    . The vanilla Arduino board does not allow to control the HW CTS serial signal from the AVR chip. But this is required to allow high performance data transfer for the dtv2ser firmware. Fortunately,this signal of the FT232 chip is available on the solder pad X3 and can be added by soldering a wire from there to a pin that is connected to the AVR port labeled “DIGITAL 9”.
.  (x) (x) (x) (x)                RTS                 .
.                       unpopulated solder pads       . The RTS line is available on the left solder pad of the unpopulated resistor found on the right hand side of the X3 pads. The RTS line needs to be connected to port DIGITAL 10 on the AVR. That’s it! Your plip2slip HW is ready!